In his weekly briefing with reporters today, Cantor sounded a different note: He understood the economic angst out there. But he was disappointed that some Democrats had endorsed a movement that pitting some Americans against other Americans, over the issue of wealth. I mentioned that Steny Hoyer, the Democrats’ whip, had just compared the Tea Party’s 2009 protests at congressional town halls to the Occupy protests – the Occupy protests, he said, may actually be more sober. What did Cantor see as the difference between Republicans endorsing the Tea Party’s protests in 2009 and 2010 (I was thinking of moments like the March 2010 health care vote, when Michele Bachmann and others walked outside the Capitol to cheer on protests) and the Democrats’ statements now? A short while later, Politico’s David Rogers pressed on part of the answer. “I did not say that,” said Cantor. “You said they were pitting themselves against other Americans,” said Rogers. 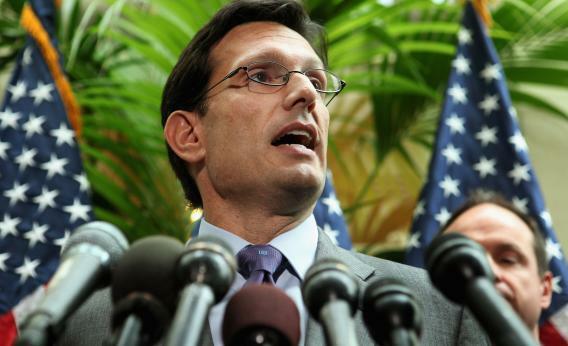 “I said they are aiming their ire at others in our society,” said Cantor. “You made a distinction between that and aiming their ire against the government,” said Rogers. “And do you not see the government as representing the people?” asked Rogers. Rogers cut him off. “I’m not asking about that,” he said. But the pen-and-pad session was over.